Of all the limited edition (numbered print run of 1200) White Wind Games, Santa Fe was my favorite – yes, even compared with Elfenroads (Summer 1993 GA REPORT). It’s hard to believe that 10 years have flown by since Alan R. Moon paid homage to Wolfgang Kramer’s Wildlife Adventure (later updated by Herr Kramer to Expedition). 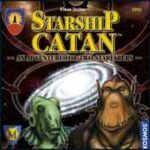 Why shouldn’t a game designer go back to an earlier design and with years of hindsight, make a tweak here and there to improve something that was already pretty damn good and attempt to address the few suggestions that gamers made over the years. For Wildlife Adventure, the critiques centered around the chance cards and inflexibility to branch or bow a route. Expedition took a family game (that was so much more, once you got past the cutesy animals) and made it into a gamer’s game. With a few colored adhesive dots you could make some very minor changes to your Wildlife Adventure board and then play WA by the Expedition rules. 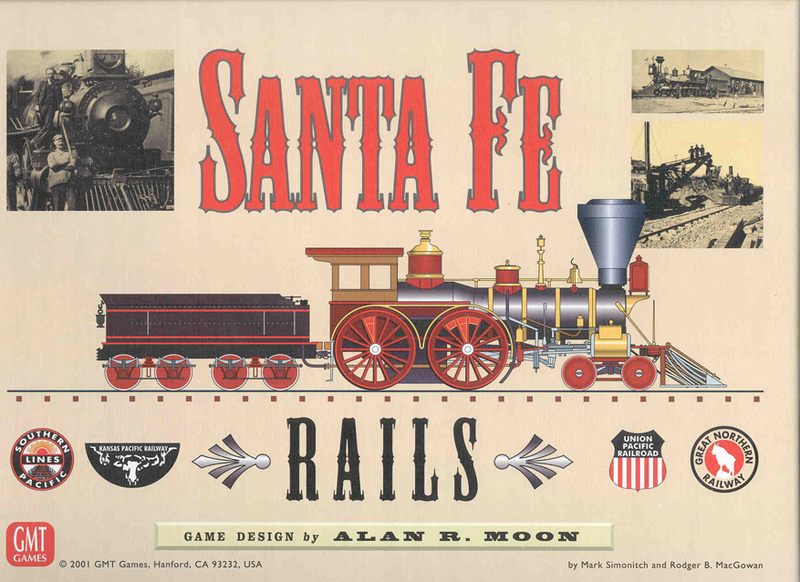 What’s strange about this entire scenario is that Alan Moon has chosen to revise Santa Fe not once but twice in the same year from different publishers, with Santa Fe Rails, released by GMT, and Clippers, released by Eurogames. 4) Boomtown markers (black wooden disks with a ‘4’ or ‘5’ on them are used, in conjunction with cards, to upgrade low scoring eastern cities by 2 points each. 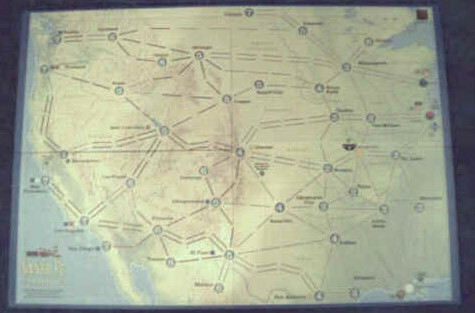 The main critique of Santa Fe was that a fortunate draw of a city card towards game end could easily negate the hard fought battles to control rail lines to reach destination cities that preceded it. Santa Fe Rails addresses this issue by adding some new ‘chrome’ as indicated in #’s 2-5 above. These new features add some additional strategic tension as more different colors can reach a city than previously. So do you display that city card you’ve been hiding or lay a large number of tracks? Do you forego connection bonuses to lay 6 tracks instead of the standard 2 or do you lay 4 tracks and still earn regular connection bonuses. Don’t like these changes? Then you could easily play Santa Fe on a Santa Fe Rails game by simply removing some cards and the short line tracks. In our playtesting we’ve found that the Boomtown markers seldom get used as there is almost always a higher scoring alternative available. An often forgotten rule from Santa Fe allows a player who has just used a “2X” card to discard unwanted city cards when they take their second track-laying turn and replenish from the city card stock. This can be a very effective way to bounce back from a hand of ineffectual city cards. 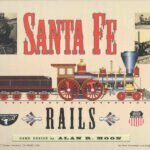 I think that the changes that Moon made in Santa Fe Rails were mostly for the good. One gripe I have is that starting a “short line” in Sacramento makes that city score too easily, making its card too valuable. We haven’t played the optional terrain rule yet. 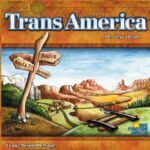 With this scenario, players start the game with $3 additional but must pay an additional $1 for tracks laid across mountains or rivers ($2 additional for both). 1) There are NO CITY CARDS in Clippers. Players get 12 teeny, tiny port markers with flag symbols. 7 port markers are pre-assigned to you by the start card that you randomly received along with your nationality (US, UK, Japan, France, Germany), but 5 are yours to place, one at a time as one of your turn options. One option even lets you MOVE a port marker to any unoccupied port space. As a result of these changes, there is more strategic tension in Clippers than Santa Fe Rails, as the choice is between playing option cards ( 2x, 3x, 5x, port) or placing a port marker on the board but only laying single ‘track’ (old habits die hard) each turn. 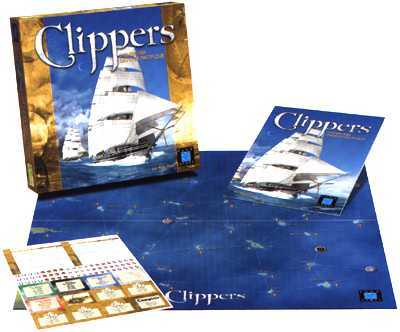 In effect, you select your own cities in Clippers and have more control of your destiny than with the luck of the cards. Paying for your option cards gives you pause to consider whether the risk is worth the reward. I really like the improvements in GAMEPLAY in Clippers, making it more of a gamer’s game, with more perceived control. Clippers does have its problems, though. As mentioned all over the net, seeing the light blue routes on a sea of blue requires decent lighting. The port markers are way too small. (This could be remedied by using Dragon’s Gold sized wooden disks in 5 different colors. [Dragon’s Gold was featured last issue.]) The board tends to form along the perimeter as players rush to influence clipper line (trade routes) toward their double 8-point ports. As a result, it almost takes cajoling to get that second colored line into American Samoa and get that damn purple clipper company rolling. Don’t get the purple company rolling and the game ends way before your can get your remaining port markers down. I’ve been wondering if the start positions were playtested extensively or not. 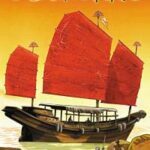 Maybe giving each player only 1 starting port marker in their “8” island (instead of 2) would make for a more balanced board.